Nowadays, patients with bite issues and misaligned teeth can choose from a wide array of orthodontic options. At Bondi Dental, one of the best options we offer is the Inman Aligner. The Inman Aligner is a modern, efficient and fast way to straighten your front teeth. If you want to achieve a straighter smile and healthier set of teeth without the discomfort of metal braces and brackets, then the Inman Aligner, which you wear 16-20 hours a day, is ideal for you! Unlike fixed braces, the Inman Aligner is a clear plastic retainer and nickel titanium springs. They are responsible for powering two aligner bows that oppose each other and guide your teeth into their proper position. 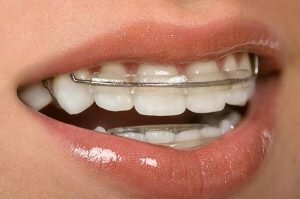 The Inman Aligners offer a constant gentle pressure that is active through a very large range of movement, which makes the retainer work quickly. The Inman Aligner lets you achieve you straighter teeth within 6 to 18 weeks. It is particularly designed to correct moderate crowding and protrusion of 4 to 6 front teeth in the upper and lower jaw. The treatment is generally completed in less than four months. Treatment with the Inman Aligner typically requires two dental appointments. The first visit is dedicated to taking impressions of the teeth and during the second visit the dentist will smoothen the teeth for the fitting of aligner. Monthly visits are required for the duration of the treatment as your dentist will review and adjust the aligner. The Inman Aligner is a fantastic alternative to fixed traditional braces. It’s ideal as a stand-alone treatment or to pre-align teeth before undergoing cosmetic dental procedures such as tooth bonding or veneers. See us here at Bondi Dental to know if you’re an ideal candidate for Inman Aligner in Bondi. To claim your FREE Inman Aligner consultation call us on (02) 9365 7187 or request your appointment online today!